There’s nothing like good quality home-made stock. This is one of the most restorative simple foods you can eat. I use it everyday. I almost always cook rice or quinoa in stock. I add it to sauces and stews. The stock is a ready to go meal in the freezer that you can easily turn into soup by adding a couple of vegetables, some beans or meat for extra protein – and there’s dinner. I haven’t met a [non-vegetarian] person yet who doesn’t like chicken soup. The gelatin heals the lining of the gut and is so soothing. It is predigested so there is no effort for the body to digest it, and it is full of protein and other essential nutrients. We’ve all heard the miracles of chicken soup. Well, this is traditional food that now has the science behind it to back up why it is the cure-all food. 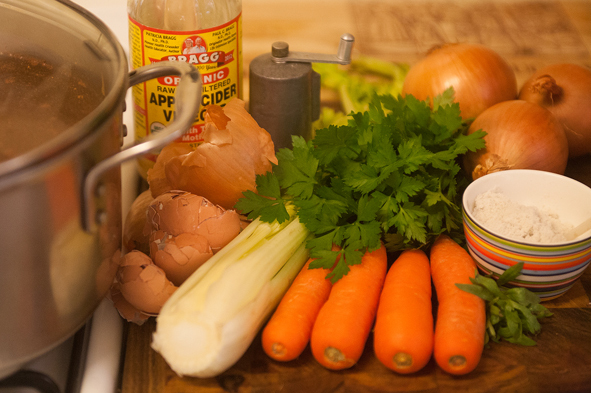 When sick with flu, gastro bug or recovering from a major illness or surgery, bone broth is amazing. I always recommend bone broth to my clients with gut issues. Especially those struggling with any of the Spectrum issues. In healing the gut, in turn, you assist the mind and memory, along with many other aspects of the body and healthy functioning. Bone broth is very high in the amino acids glycine and proline which are essential for healthy connective tissue, like the ‘glue’ that holds our bodies together, without these two amino-acids, literally, we would fall apart. Glycine has a calming effect on the brain and nervous system and helps the body synthesize collagen and glutathione, a great detoxifier and antioxidant. It helps regulate blood sugar levels and has a major role in supporting healthy digestion. Glycine reduces inflammation throughout the body by reducing the activation of the inflammatory cells, whether that be from an infection, a wound or intestinal issues. Proline, the other vital amino acid in stock is great at healing and aiding supple skin, strengthening cartilage, ligaments, tendon and blood vessels. Helping avoid hardening of the arteries and decreasing the risk of heart attack. Bone broth is also one of the best ways to build strong bones and teeth with its high amounts of calcium, magnesium and phosphorus. Yes, that’s right, bone [bone stock] builds bone and helps give the bone some flexibility through strengthening the collagen in the bones and joints. This is essential for when we fall, and at some point we all take a fall. It’s imperative that our bones have a little flex to them, so the bones aren’t brittle and fracture easily. The collagen also assists in strengthening nails, hair and skin by supporting the connective tissue and can assist in elimination of cellulite. When I buy a couple of items from my organic butcher, he is happy just to give me the bones, or some butchers charge a little for these bones, but it’s not much. And after we eat a chicken, I save the bones in the freezer. Chicken bones with joints are particularly good because of the gelatin in the joints, especially the gelatinous bones like the wings. Beef bones are good too, but choose the joints for more gelatin. If using raw bones, bake them in the oven for half an hour at 180 Celsius prior to adding them to the stockpot as it will improve the taste of the stock. The addition of onion skins is great too. Yes, the papery part of the onion is what I mean. It is more nutritious than the rest of the onion – full of flavonoids with anticancer, antioxidant and anti-inflammatory properties. Not one piece of onion skin in my house goes anywhere but into my stockpot. I also add left over eggshells to this bag in the freezer and use in the stock, as it increases the calcium in the stock. Bone stock is one of the healthiest most inexpensive foods you can eat. And making stock is so simple you can’t go wrong. Place all ingredients [except fresh parsley] in a stockpot with filtered water, covering all the ingredients. Bring to the boil and then simmer. In the first couple of hours of simmering, skim off any scum and foam from the top and discard. The cooking times vary depending on the bones used. Chicken bones simmer 24 hours. Beef bone simmer 40 hours. Fish bones and seafood shells simmer 8 hours. It is possible to make stock in 3 hours, it just won’t be as nutritionally dense as it could be. But it will still taste great and will be nutritionally miles ahead of any store-bought stock. Once you have completed the cooking process, strain the stock. You can make larger batches than this recipe, and once cooled, put into ziplock bags and stack them in the freezer so you always have stock ready to go. Please let me know how you go with the recipe. It will be the most inexpensive nutritionally dense food you will probably ever make.